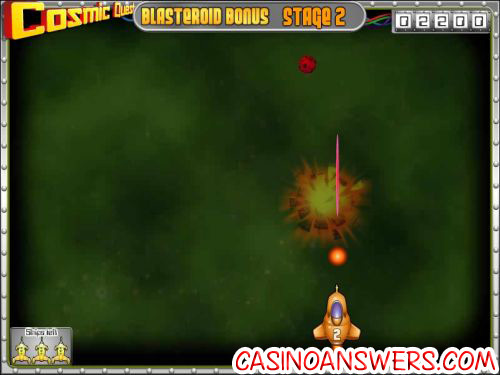 Cosmic Quest: Mission Control iSlot Guide & Review - Casino Answers! 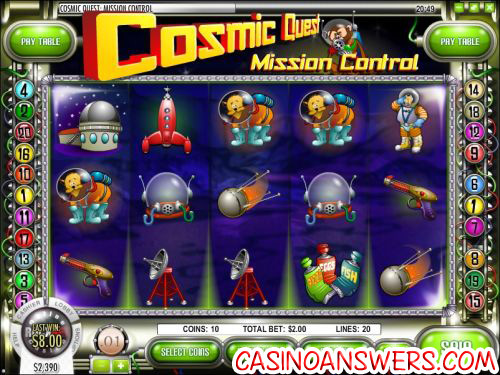 Cosmic Quest: Mission Control is a 5-reel, 20-line iSlot-branded video slot, featuring wild symbols, scatter wins, expanding wilds, free spins and a multi-level bonus game. You can play the Cosmic Quest: Mission Control iSlot at Bovada. To play Cosmic Quest Episode 1, set your coin size at $0.01, $0.05, $0.10 or $0.25 and choose how many coins you want to bet (up to 10). You can also set the number of active paylines (up to 20). The betting range gives you the ability to make a total bet of as little as $0.01 and as high as $50 per spin. When you are ready to play the Cosmic Quest iSlot, use the “Spin” button or “Bet Max” for 10 coins and 20 paylines. There is an autoplay mode available to real money players. To win the 5000 coin top jackpot on the Cosmic Quest: Mission Control video slot, you must have five Wild Rocket Ride symbols appear on an active payline. The Wild Rocket Ride symbol is wild, meaning it will substitute for all symbols in the slot game except for the bonus and scatter symbols. It will become an expanding wild during free spins. You can play for these free spins at Bovada! When three or more Scatter Monkey symbols appear anywhere on the reels of Cosmic Quest, you will be given 10 free spins. Whenever the Wild Rocket symbol appears during the free spins feature, it will become an expanding wild, meaning the entire reel it is located on will become a wild, thus creating many more possibilities to win. The scatter symbol does not pay out by itself. All wins are multiplied by coins staked per line except for scatters. All wins pay left to right except for scatter symbols. Only the highest win is paid per selected payline. Bonus wins are added to payline wins. While not quite as heavy on the storyline as many of the other iSlots, Cosmic Quest: Mission Control still provides a fun bonus game, a decent free spins feature and a good top jackpot. To play the Cosmic Quest interactive slot game, sign up and make your deposit today at Bovada! Can American players play the Cosmic Quest iSlot game? Can I play Cosmic Quest in my browser? Yes, Rockbet Casino has an Instant Play casino that doesn’t require any downloading, making it ideal for players who do not wish to download their casino client as well as Macintosh users. If you experience issues playing the Cosmic Quest iSlot Flash Game, try installing the latest version of Adobe Flash Player. Can I get free cash to play the Cosmic Quest interactive slot? Yes, Casino Answers has an exclusive $100 free cash no deposit bonus offer from Rockbet Casino (use this link) that can be played on all slots.